Understanding how the ear works. 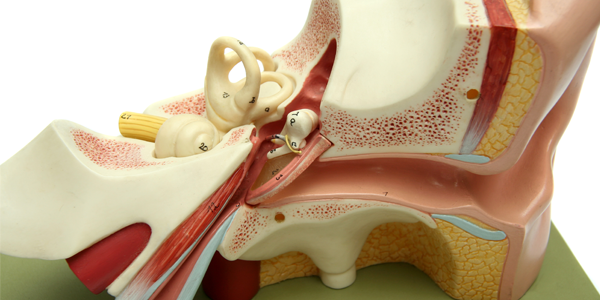 To understand hearing loss, you must first know a little about how the ear works. The human ear is a remarkably complex sound analyzing system, capable of detecting sounds over an incredibly wide range of intensity and frequency. We usually describe the ear in three main sections: the outer ear, the middle ear and the inner ear. The outer ear serves as a sound collector. 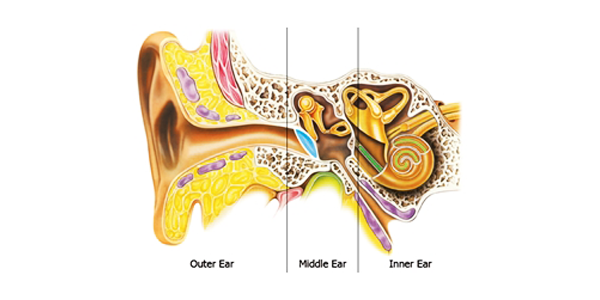 Sound vibrations cause movement of the eardrum which is connected to a chain of three tiny bones in the middle ear. The middle ear system serves to intensify the energy of the sound vibrations and delivers them to the cochlea in the inner ear. The cochlea is the actual organ of hearing. Inside the cochlea are thousands of hair-like cells that are connected to fibers of the hearing nerve. These hair cells are sensitive to different frequencies and intensities of sound. Sound vibrations entering the cochlea cause the hair cells to generate electrochemical signals which travel through the hearing nerve to the brain where they are recognized as sounds. A person with normal hearing can hear everything from the faintest whisper of the breeze to the roaring of a jet engine taking off. Normal hearing alerts us to dangers – our ears can give us information about the location and speed of an approaching car, for instance. With good hearing we are able to listen selectively, focusing on one conversation at a loud party and shifting easily to another conversation without missing a word. We are able to appreciate the beauty of a string quartet and the sound of a loved one’s voice. How do you know if you suffer from hearing loss? Chances are, you will be the last to know. Most hearing loss happens so gradually that you may not notice it until it becomes a big problem. The people around you will notice it first. You may have to ask people to repeat themselves, especially if there is any background noise. You may make mistakes and need to turn up the T V louder than before. You may fail to hear the doorbell, the telephone and/or warning signals. As the hearing loss worsens, you may find yourself straining to hear conversations and becoming tired from the effort required to listen. Over time, you may find yourself avoiding social situations and losing interest in activities that you once enjoyed. Approximately 500 million people worldwide suffer from hearing loss. Although nearly 20 % of persons between the ages of 65 and 74 have a significant hearing loss, it may surprise you to learn that the population of hearing-impaired people is getting younger and younger, largely due to excessive noise exposure. A recent survey by the Better Hearing Institute in the US found that 14.6 percent of baby boomers (ages 41 – 59) have a hearing problem and 7.4 percent of Generation Xers (ages 29 – 40) already have hearing loss. Hearing loss has been called the invisible handicap yet the impact on quality of life can be profound. A study by the NCOA (National Council on Aging) in the US revealed the following: Hearing impaired persons with untreated hearing loss report increased feelings of depression and anxiety, increased paranoia and social phobias, more anger and frustration, increased introversion and feelings of self criticism. They also report decreased overall health, decreased social activity, and even decreased earning power. Fortunately, the situation can be greatly improved for most people with hearing loss. The same study revealed that persons with treated hearing loss (through hearing aids and/or medical treatment) report better family relationships, higher self-esteem, improved mental health, greater feelings of independence and security, better overall health and increased social activity. Hearing instruments are divided into three main types: BTEs (those that fit Behind-The-Ear), ITEs (those that fit In-The-Ear) and RITE (a combination of BTE and ITE). BTE hearing instruments sit behind the ear and use a separate piece called an earmold or a thin sound tube with a soft silicone earpiece to direct sound into the ear canal. Larger sized BTEs can fit more severe hearing losses and may incorporate more features than the smaller models. 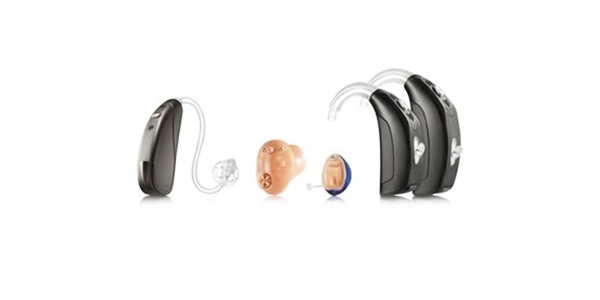 ITE hearing instruments come in several subcategories. The size and shape of your ear and your degree of hearing loss will determine which style and size of ITE instrument is best foryou. RITE (Receiver-In-The-Ear) instruments are a hybrid type where the main components of the system sit behind the ear and the receiver (speaker) sits in the ear canal. Our hearing care professional can help you choose the hearing instrument type that will be best for your hearing loss and your lifestyle.